As April 10th gets closer with each passing day, our excitement builds for the Garden’s first spring party, the Antiques & Garden Fair Preview Evening. We talked with Cathy Busch, one of the co-producers of the show to get an inside look at what they have in store for us! 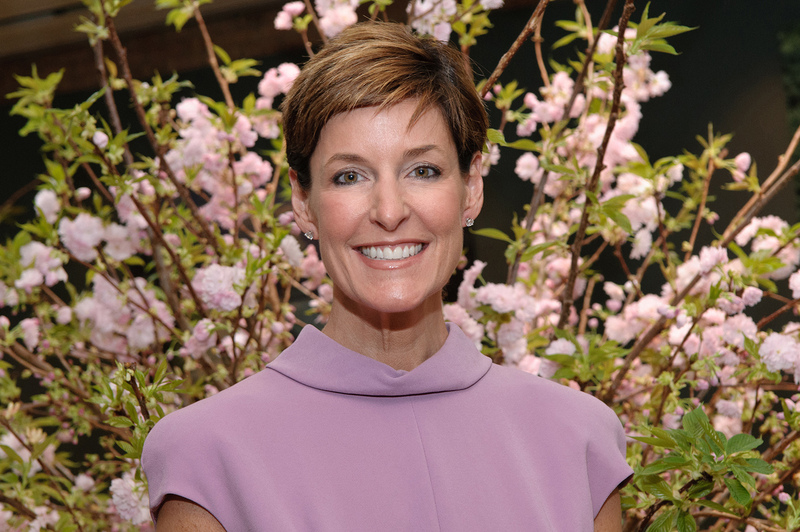 Cathy, you have supported the Garden’s Antiques & Garden Fair for years as a Co-Producer. What do you like best about it? I have always thought of this event as the unofficial kick-off to the spring season in Chicago–whether Mother Nature cooperates or not! The past few months spent in the polar vortex were grueling and our hope is that people will be inspired to step out and reconnect with friends they haven’t seen in a while. There’s a celebratory feeling about the whole weekend, beginning with the preview party, where guests have the first chance to shop. It’s a chance to see beautiful objects, think about new ways to live and entertain well this summer, or just feel part of a welcoming community. We hope people will visit the Garden, this year especially, and feel the winter blues fade away. 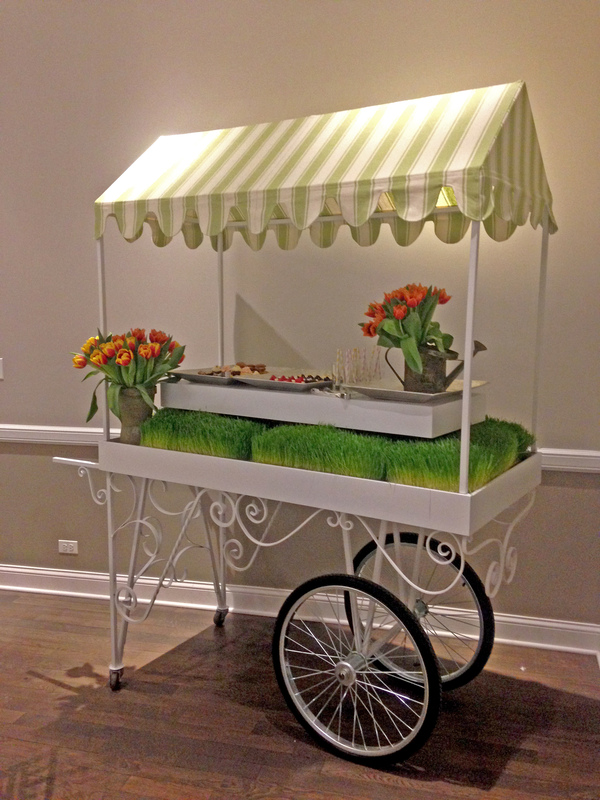 Hors d’oeuvres will be served on new rolling carts this year. A great party needs great food and drinks. Do you know what’s on the menu this year? Our caterer again this year will be Jewell Events Catering and they always pull out all the stops for this party. Their creative and culinary team really understand Preview—the importance of shopping, socializing and sampling! They’ve devised charming new garden carts this year that will stroll through the aisles so the food comes to you! We happen to believe that if you’re well fed, you’re in a good mood! The seasonal food complements all the other influences at the show—it’s a complete sensory experience. 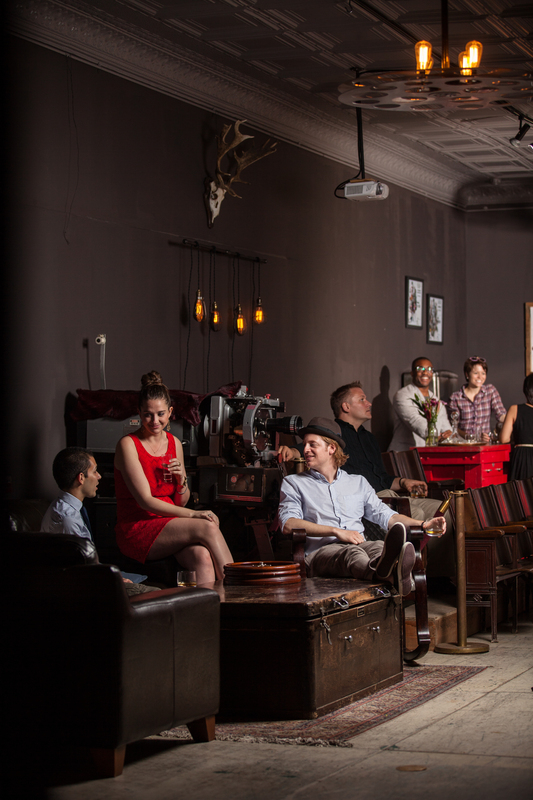 The Isle of Man is creating a Men’s Lounge for this year’s preview party. This event has done a great job attracting women to shop and have a fun night with girlfriends. What about the men? We absolutely hope the men will come! New this year at the preview party will be a Men’s Lounge assembled by the creative team at Isle of Man America in Chicago. They’ve thought of everything to entertain the guys: vintage motorcycles, humidors and sporting equipment, custom furniture and good scotch—just a lot of cool masculine stuff. For the men who also stroll the booths, there will be fabulous food and drinks circulating throughout the fair. No one will go home hungry! What’s so special about a Fair at the Garden? The setting is what really sets us apart from other national shows. The Chicago Botanic Garden is a cultural gem and a leader among national gardens. Being there, surrounded by hundreds of acres of natural beauty when spring is just beginning to show its promise is pure magic. We hope first-time visitors will fall in love with the Garden and come back often to see the gardens grow more and more beautiful as the seasons progress. Tell us about the speakers who will be appearing at the Fair this year. Quite a lineup! We are so excited about this year’s speakers! Miles Redd is one of the hottest talents in interior design today. His fresh and fearless approach to design, his exuberant use of color, and his ability to mix periods and styles are inspiring. He’s oozing with talent and, oh, by the way, he also happens to be incredibly nice. His friend, Danielle Rollins, is a star in her own right too! As the reigning guru of entertaining and author of the stunning book, Soiree, Danielle claims a successful party is all in the details and we will be there with our pencils sharpened taking notes. My well-mannered English bulldog. Well-groomed is another story! You have exquisite taste and have made your home a great space for entertaining. Have you found any items at the Fair and how do they create a great space for entertaining? There are so many tempting objects to drool over at the show! I’ve managed to pick up a few things over the years—some fun mid-century pieces that are easy to mix, unique silver and gifts. I’m also a sucker for vintage Lucite. 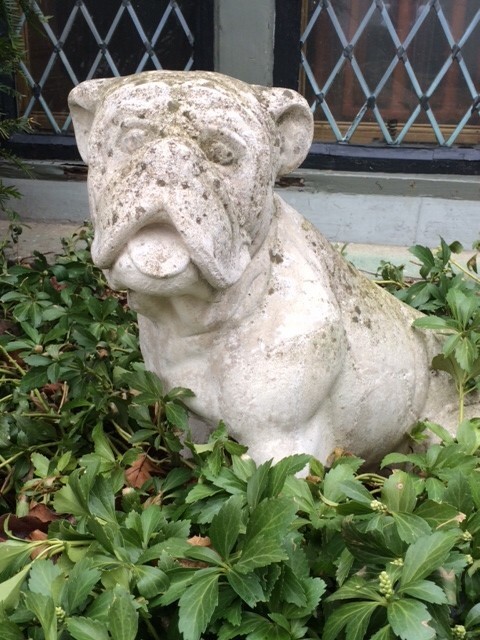 My favorite find is definitely a goofy stone English bulldog statuary that lives in our backyard. Our bulldog, Rose, just can’t figure it out, terrorizing it until she collapses from exhaustion. The statuary has far better manners and is better looking than the real thing for sure. Are you anticipating any trends this year? What will you be watching out for at the Fair this year? Old school garden statuary and antiques will never go out of style, but I think we’ll see more mid-century offerings this year because living with them is so easy and chic—nothing too precious or off-limits. 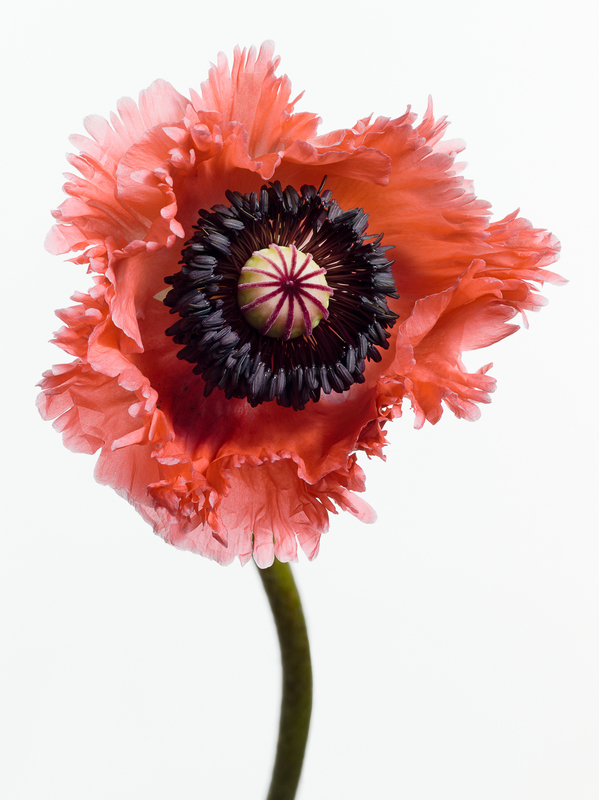 I’m excited about some of the incredible new talent appearing at the Antiques & Garden Fair this year—Janus et Cie for chic outdoor furniture and acclaimed New York photographer, Paul Lange, with his giant blooms, to name a few. Next Next post: Springvision comes to the Garden!